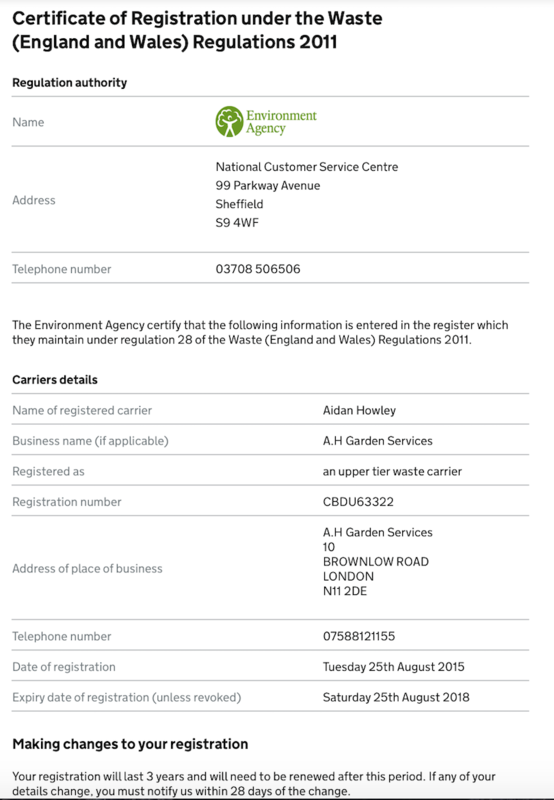 A.H GARDEN SERVICES provide a professional standard of garden maintenance services in North London. Our team of gardeners understand the ideal growth habitat, specific plant requirement and eco system associated with each growing organism within your garden. We ensure these factors are facilitated correctly to allow all elements of your garden flourish just as it should! Hands on experience combined with an obliging attitude towards all of our customers needs makes us the best choice to help you maximize your gardens potential in North London. A.H Garden Services achieving excellence for your garden. In adapting a systematic approach towards all your gardening tasks, A.H Garden Services get the job done quickly whilst achieving the highest standard of workmanship possible. Just leave the hard work to us and we guarantee to provide a service which will exceed your aspirations. We will also provide tips and advice on plant and garden care to help you continue maximize your gardens appearance when were not there to do it for you. See below how we can help you obtain amazing results for your garden today. Are you looking for Garden Maintenance in North London? Q - Is there a minimum booking time for garden maintenance? Q - Do you take away green waste? A - Yes - However anything above 100 Litres of green waste disposal carries an additional cost. Q - Are parking charges included? Q - Do you have your own tools and equipment? A - Yes, we have everything we need to carry out the works. Please see our Areas Served Page to see the areas we cover for Garden Maintenance in London. If you have any questions please call Aidan on 07588 12 11 55. Alternatively if you would like to make a booking please visit out where you will be able to provide all the information necessary for us to get back to you. To understand how A.H Garden Maintenance Services can help you achieve garden satisfaction see our job profiles below. If your garden contains an organic grass lawn then regular mowing of the grass is essential. Although a simple process this must be carried out correctly to ensure the health of the ground is maintained. We identify the composition of the grass and advise on the most suitable frequency of mowing. Our automatic rotary lawn mowers with built in rollers provide the best looking striped lawn cutting in town. Our team will also assess any grass growth / sub soil drainage / fertilization - soil quality issues present and provide the relevant advice to remedy these problems ensuring your lawn has what it needs to flourish and grow to its mazimum potential. The gardens and driveways of north london are abundant with varied species of hedges and topiary. The correct identification of hedge species your hedge belongs is paramount to hedge cutting. The subsequent cutting and pruning technique used and the time of year this is carried out will significantly improve the health and subsequent appearance of your hedge. 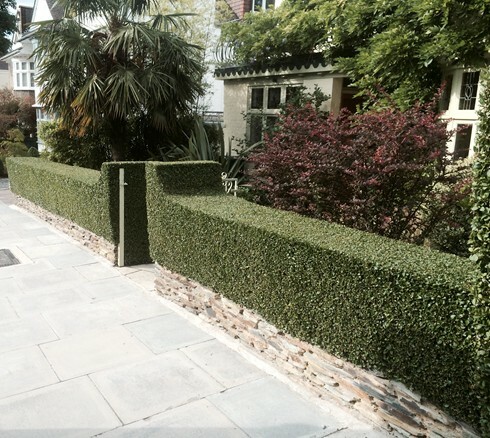 We can shape any hedge to your desired look and also use more delicate hand tools to manicure your topiary plants. We can also source and plant any new hedge species you want for your garden and if your old hedge needs removing we are best placed to carry out this correctly ensuring your new hedge grows as it should. Has you garden been neglected for some time and you now need some professional help to revive its appearance? Dont let this situation overwhelm and stress you. A.H Garden Services have dealt with countless, extensive Garden Clearaces in London and are best placed through our experienced gardeners and professional industrial equipment to handle the most complicated garden clearances required. All of the green waste will be recycled and we can also remove any general waste that is present and unwanted. If you are worried that the only access to your garden is through your house worry no more. We will fully protect all carpets and flooring areas and ensure your house is left as clean and tidy just as we got it. When we are carrying out the works we can offer any of out other services to help better the appearance of your garden. If you would like to discuss any aspect of you proposed Garden Clearance in London please get in contact. Hard standing areas within your garden including patios, driveways, garden paths, brick paving and decking surfaces all require seasonal pressure washing. This not only enhances their appearance making your home and garden more cleaner but also serves to maintain the materials involved and imporove their longevity within your home and garden. All surfaces are first treated with a cleaning solution, compassionately scrubbing the surfaces to maximize the Pressure Washing process. The washing will help remove algae, dirt and grit created by the elements and foot traffic. Left untended these create dangerous surfaces and fast track decay of your wood. For those who want to increase the growth speed and vitality of an already planted hedge, nutrition will help achieve this. Nutrient deficiency identifiable from the yellowing of the plant leaves can also highlight the need for a nutrient application. A.H Garden Services will identify the best product available for application to you individual hedge needs. Annual and epehemeral weeds require yearly control to maintain the visual appearance of any planting area. We never use chemicals within flower beds and our hard graft will takes care of the problem. We can also supply and lay organic mulches like wood chip which are a great natural weed suppressant. Please get in contact if you have any questions. We want to help better your garden environment.